KHULNA, Bangladesh — In May 2009, Cyclone Aila swept over the southwestern coast of this country and lashed the small village where Rashida Gazi and her husband Rezaul live. The middle-aged couple, who eked out a living from farming and raising livestock in Koyra, knew the cyclone was approaching. But in spite of ample warning, they did not immediately flee to a concrete cyclone shelter, though one was only about a mile away. Only at the last minute did they leave their mud and thatch hut for the safety of a neighbor’s concrete house. That decision likely saved their lives: their home, chickens, tools and few belongings were washed away in the storm, though they managed to save their goat. The Gazis are just two of about 3 million people affected by Aila when it destroyed homes and crops and flooded farmland. People gesture towards a tree that collapsed on a house after Cyclone Mahasen battered Bangladesh’s low-lying coast on May 17, 2013. Risk assessment studies conducted after Cyclone Aila were telling. They found that rural people like the Gazis who didn’t evacuate immediately thought cyclone shelters were too far away, too crowded or poorly maintained. Women were particularly vulnerable. They are often the last to leave home because they are in charge of the house and livestock — often a villager’s most precious asset. Preparing for natural disasters is essential in low-lying Bangladesh.This river delta country has hundreds of rivers and sits on the edge of the Bay of Bengal, making it especially vulnerable to cyclones and floods, which happen nearly every year. 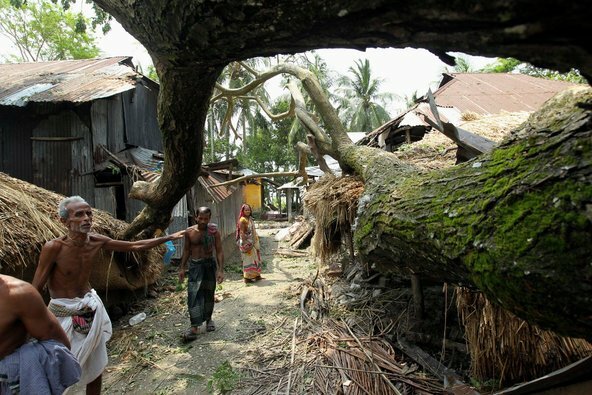 This May, Cyclone Mahasen hit coastal areas with a glancing blow but left 17 dead and 1.2 million people with losses and damage. Cyclones can happen in the spring and fall, during two cyclone seasons that last several months. As the world’s most densely populated country with 152 million people packed into a space smaller than Iowa, natural disasters here can be especially devastating. So what can be done to help people weather cyclones in Bangladesh? The country has already had an effective warning system for more than four decades. 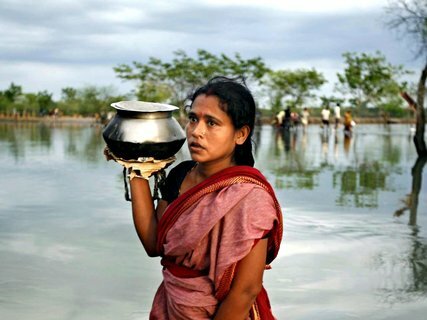 But since 2004, Bangladesh’s government and international organizations have been strengthening disaster management programs to get more people to shelters and help them through the painful aftermath of cyclones. Bangladesh’s cyclone warning system was born out of such a disaster. A deadly 1970 cyclone killed about 470,000 in Bangladesh, and spurred the creation of the country’s Cyclone Preparedness Program in 1972 that is today run by Bangladesh’s government and the Bangladesh Red Crescent Society. While Bangladesh’s program is a far cry from the $20 billion plan to fortify New York City against storms as announced by Mayor Michael Bloomberg in June, it has worked remarkably well in this predominantly poor country. In 2007 Cyclone Sidr struck Bangladesh and killed about 3,000 people. The storm was blunted by the Sundarbans, the huge mangrove forest in southwest Bangladesh, but Oxfam estimated the cyclone warning system helped saved 100,000 lives. The program has 135 full-time employees so relies on a grassroots network of tens of thousands of volunteers. When I first visited the cyclone warning control room in Dhaka in 2007, it was low-key with just four desks, maps pinned to the wall, and some radio equipment in a corner. The office receives reports from Bangladesh‘s meterological department, tracks storms and transmits alerts to district offices via radio. In a impressive feat of coordination, volunteers on the ground trained in first aid and rescue techniques are equipped with megaphones, hand sirens, flashlights, flags and radios to send out cyclone warnings in villages. On a visit this spring, the office appeared nearly the same, though now there is a flat screen TV on the wall and a new conference table. But it has grown in other ways. The number of volunteers is 49,000, up from 42,000 in 2007. More women have been recruited so they now account for about 30 percent of volunteers, and can help convince other women to evacuate earlier. Mosques have long been enlisted to blast alerts through megaphones normally used to sound the daily calls to prayer. Trainings, mock drills, as well as social gatherings and theatrical performances throughout the year keep volunteers motivated. And there is something to be said of the official vests that volunteers proudly wear. “They need a lot of interaction,” said Ekram Chowdhury, director of operations for the Cyclone Preparedness Program in Dhaka. He admitted that younger volunteers are not as motivated as older ones who have vivid memories of destructive cyclones in 1970 and 1991. ‘’From this history and hurt, they started work without pay,’’ he explained. Other disaster management programs are now focusing on building practical shelters and strengthening recovery after cyclones with support from Bangladesh’s government, European aid agencies and the United Nations Development Program. To address the problem of poorly maintained, distant shelters that people like the Gazis are reluctant to use, new ones were built in central locations in villages. These multipurpose shelters do double duty as schools or community centers so they are maintained year-round by village committees instead of falling into disrepair. There are about 4,000 shelters and government offices that can be used as shelters, but about 1,500 more are needed in cyclone-prone areas of Bangladesh. 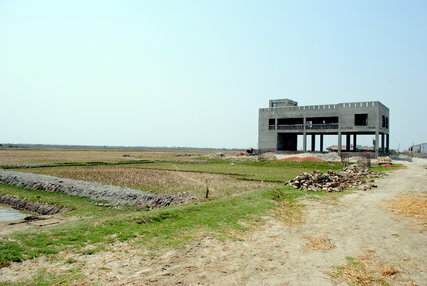 A new cyclone shelter is almost complete in Bainpura village near the Sundarbans forest in southern Bangladesh. On a recent spring afternoon in Banishanta village, a 40-minute boat ride from the port city of Mongla, children laughed and called from the second floor of a large, two-story school. It is also a cyclone shelter whose empty concrete ground floor is for livestock brought along by evacuees. The second floor rests on tall, thick pillars and can hold thousands of people. More latrines, especially for women, have been added to cyclone shelters. Kalada Islam, a young woman in her 20s, shyly admitted that lack of toilets was the ‘’biggest problem’’ during Cyclone Aila when she and her husband fled to an overcrowded shelter in Koyra. To assuage people’s concerns about transporting important belongings in storms, watertight containers have been distributed to 12,000 families for storing documents, seeds or food that villagers can take with them when evacuating. Most poor, rural people in cyclone-prone areas live in flimsy homes made of thatch or tin roofs, and mud walls and floors. Sturdier cyclone-proof homes are now being tested. Dozens of tidy one-room homes with concrete foundations and walls are being piloted in Bainpura, a remote village on the edge of the Sunderbans. The homes were designed by the Housing and Building Research Institute in Dhaka to withstand winds of 130 miles an hour. They have wavy ferrocement roofs instead of corrugated metal, which can blow away in strong winds and become hatchet-like projectiles. A small rooftop solar panel is detachable for safekeeping during storms. The devastation continues after cyclones have passed. After big storms, sources of drinking water such as ponds are often contaminated by salt water and debris. Homeless evacuees resort to open defecation in close quarters, which can lead to water-borne diseases such as dysentery and typhoid. After Cyclone Aila, the Bangladeshi non-governmental organization BRAC constructed 2,400 latrines on high ground and embankments in cyclone-afflicted areas and disseminated information on public health issues, including nutrition, water and sanitation, diarrhoea and skin rashes. Tanks to store rainwater were also built and installed in villages. In Banishanta, one such rainwater harvesting system funded by international aid agencies sits next to the local mosque. Mohammed Showkat Osman, the imam at the mosque, says people bought jars of clean water or drank pond water before the rainwater system was built. BRAC has installed two desalinization plants in coastal areas that can supply clean water before and after natural disasters. Even after a cyclone, the struggle for survival continues if livelihoods are wiped out. Cyclone Aila created a tidal surge that flooded fertile land in Koyra with saltwater for two years and rendered it barren. More than four years after the storm, thousands still struggle to make a living. Mohammed Musa, a 30-something resident of Koyra, was displaced from his home when his land was flooded after Aila. Miles of what was once lush land full of fruit trees is now a cracked moonscape. Unable to farm, Musa survived on sporadic fishing in the Sundarbans even though man-eating tigers roam the forest. Bangladeshis waded through floodwater that flowed into new areas of the country in the aftermath of Cyclone Aila. The NGO Relief International is helping the poorest cyclone victims find alternative ways to earn money, from grants of livestock like goats and chickens, to materials for building a simple shop, or providing training for fattening crabs or farming fish. Musa recently received a bicycle cart from Relief International and now earns as much as 150 taka (nearly $2) a day for transporting goods and people in the village, compared to 80 to 100 taka ($1 to $1.30) from fishing. Musa doesn’t risk going into the Sundarbans anymore. Awareness and disaster preparedness is critical in poor countries that lack professional first responders. Bangladesh is subtly integrating education about both, along with the impact of climate change into school curricula for grades three through ten. Schools here practice safety programs and drills nationwide in March and October.